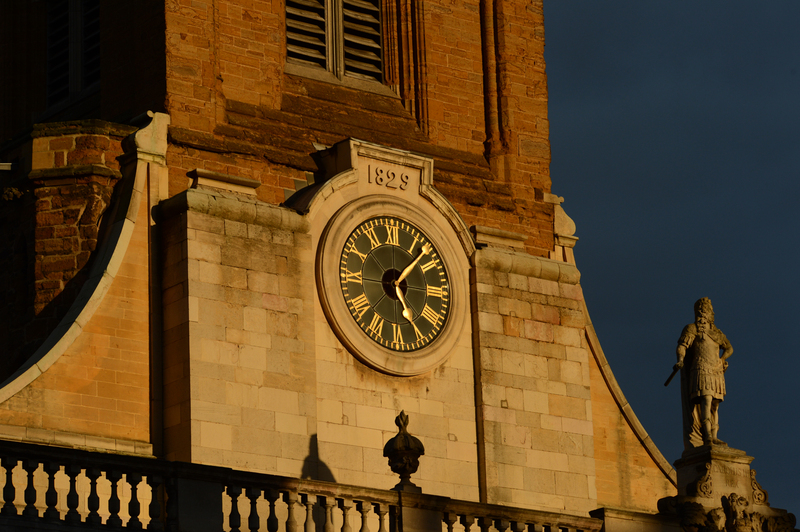 I don’t think I’ve explored Northampton for around 20 years. It’s so long ago I don’t really remember that much about it, so today’s sojourn was a bit of an eye opener. It started well. I arrived at a railway station that’s seen £20m invested in a new split level building that’s replaced an old, cramped 1960’s structure. This simply couldn’t cope with the level of passengers the line’s seeing nowadays. I was similarly impressed with the new complex that housed my hotel & a Vue cinema. The warning signs began when I took the hotel lift & noticed the large dents in the doors. Had the Incredible Hulk stayed here and got annoyed or was this the aftermath of a ‘normal’ Saturday night in an Ibis? My room’s pleasant enough, although it would have been nice to have TV channels that broadcast more than than a little box that says “no signal” but – hey ho – the wifi’s fine & that’s more important. I thought it was very kind of the staff to leave an ironing board & iron on the landing outside my room until I tried to bring it in and realised the iron is wired in to a socket and it ain’t going nowhere. Maybe in the morning I can strike lucky & slip a couple of quid to someone in the queue to do my shirt. I was even more impressed with Northampton Guildhall which is a stunning Neo-Gothic building dating from 1861. Sadly, other bits of the town haven’t worn so well – and I’m not just talking about the buildings. Considering this is a county town well within commuting distance of London (hence the new station) there’s far more vagrancy than I’ve seen in many towns in my recent travels. I always try & explore places I stay to get the feel of them but this one reminded me more of Lincolnshire. Why? Well, it’s ethnically mixed and it’s these people who seem to be doing all the work. Many workers I came across probably have Polish, Patois or Punjabi as their first language. In contrast, the town’s monuments were draped with a variety of young & old derelicts & the lost who were overwhelmingly white. I struggled to find a decent real ale pub to find here (another black mark) so ended up in a Lloyds No 1 Bar (the local Wetherspoons was more like a drop-in centre than a pub). The bar was quiet but with a mixed clientele – apart from two pissed middle aged blokes – one of whom was loudly trying to convince everyone within earshot that ‘they’ had made it illegal to call the Union Jack by that name and anyone carrying it would be arrested by the police. Monday night in Northampton eh? After that I decided discretion was the better part of valour and retreated to my hotel to type up these experiences. Tomorrow I’m looking forward to talking about a very different time. The official opening of the new rail college. I’m sure that will be a much more positive experience! I thought the anti Hs2 campaign couldn’t find any more of the barrel-bottom to scrape but their cynical attempts to exploit the steelworkers has proved me wrong. 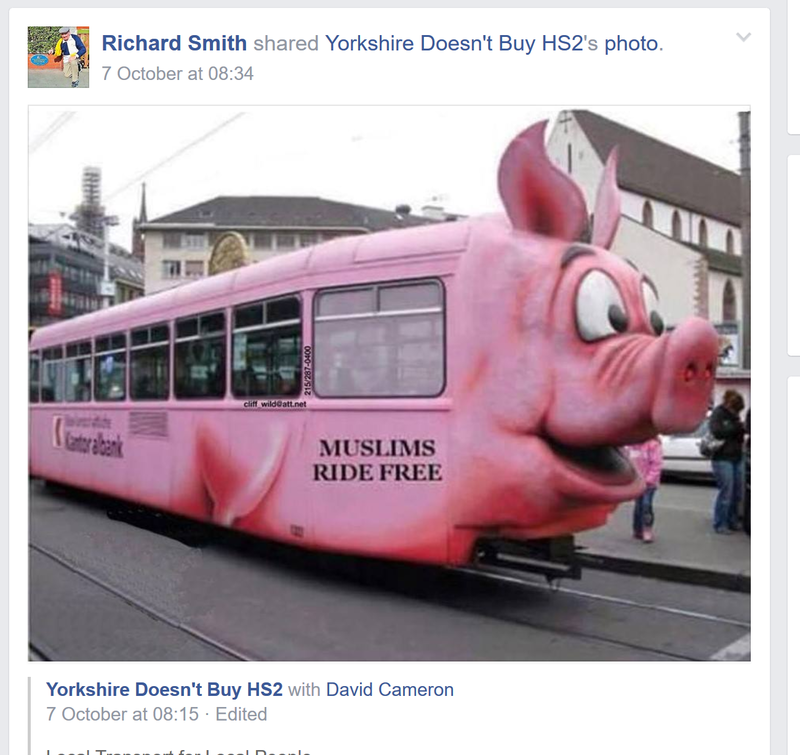 First out of the traps was the main Chiltern Nimby group, Hs2aa with a tweet of such breathtaking stupidity it spawned this blog. Obviously, they’re so ‘concerned’ about the UK steel industry they didn’t even realise Redcar isn’t the country’s last steelworks. We’ve had a number of people jump on the bandwagon since then. Here’s a sample of some of their tweets. So, what do a Bucks Doctor, A Devon Reiki Master and a Camden ‘activist’ have in common? Well, you can bet your bottom dollar it’s not the welfare & jobs of UK steelworkers. If they really were so bothered about steelworkers they’d be campaigning FOR Hs2 to be built and for the steel to do it to be produced in the UK – but hell will freeze over before they do that. 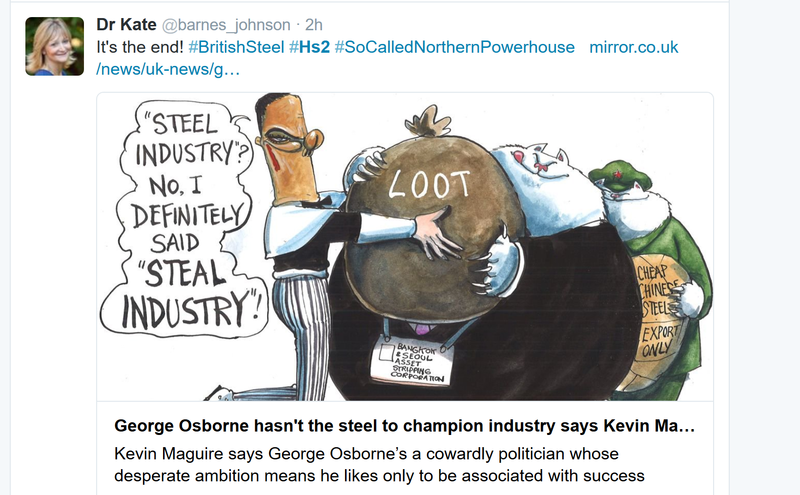 Their level of intellectual & moral bankruptcy says an awful lot about the anti Hs2 campaign – as does their efforts to defend their cynical exploitation of others misfortunes for personal or political reasons. The sooner their increasingly unpleasant campaign is put out of its misery, the better. 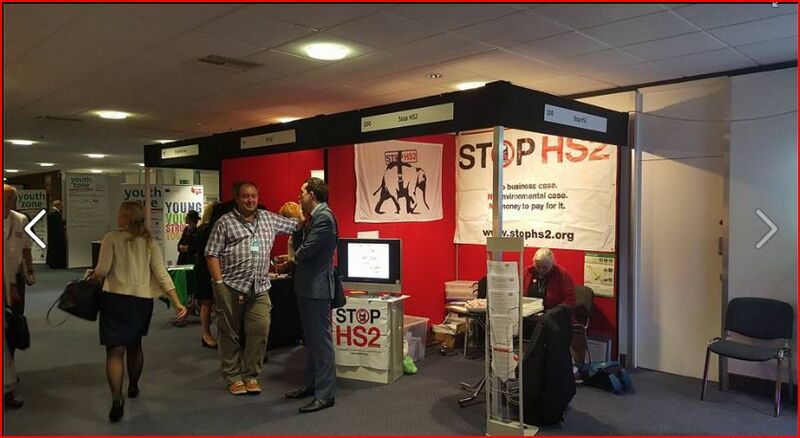 Now the party conference season is over I thought it would be a good time to take a look at the anti Hs2 campaign to see if they’ve made any headway after touting themselves around the various conference venues. StopHs2 made some daft claims about how ‘busy’ their stalls got which was contradicted by people tweeting pictures like this. So, let’s see if any of their claims are backed up by any statistics. Of course, the answer is – no. Their social media campaign’s still a disaster. Take a look. We now have eight months worth of figures to analyse which show that – not only is their campaign failing to reach people, in some cases it’s still going backwards. 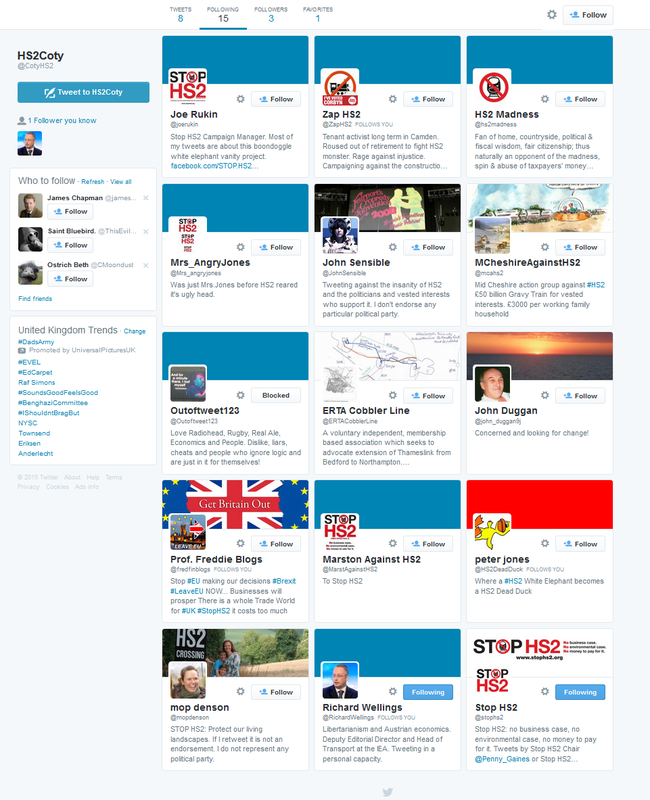 The usual caveat applies – not all followers are supporters, many are there just to keep an eye on them. Here’s a breakdown that shows how many more people each of them have reached in 8 months. 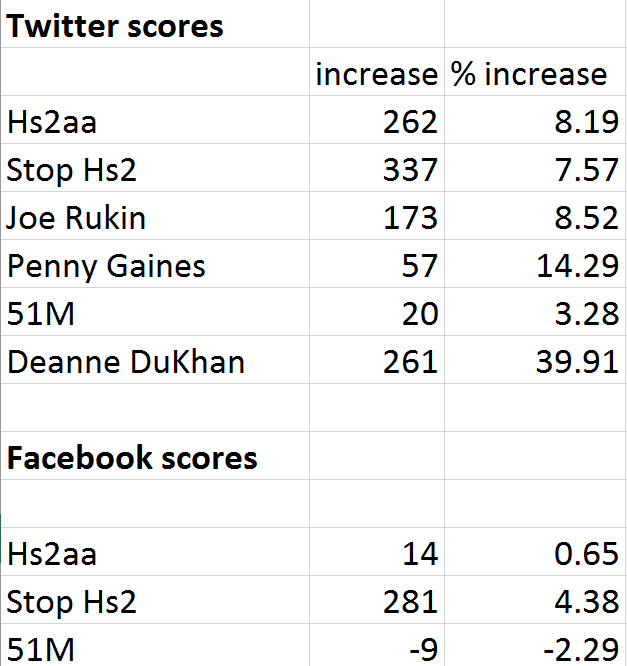 There’s a wonderful irony in the fact that the most successful, Deanne Dukhan has pretty much abandoned tweeting about Hs2 & moved on to other things. This isn’t much of a surprise. 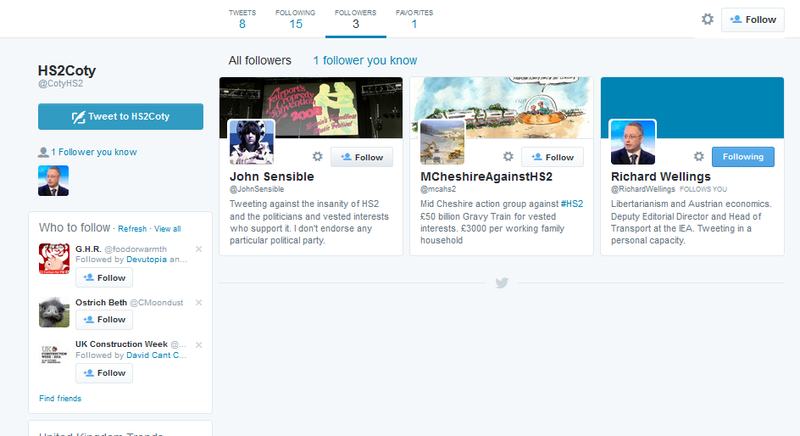 Deanne was Campaign Director of the woefully inept AGAHST (Action Groups Against HS2) which ceased to exist. You can find their abandoned website here. I’m still keeping her in to provide a useful contrast. To say these numbers are woeful is an understatement. Look at Stophs2. After eight months they’ve only reached another 337 people on Twitter and 281 on Facebook. The numbers show there’s been absolutely no improvement after the party conferences – which have proved to be a waste of both their time & dwindling resources. The Facebook stats are of particular interest as it’s Facebook that has by far the biggest audience with 30.3 million users in the UK compared to Twitters 13.8 million. Away from social media the news is even worse. Bucks County Council leader Martin Tett has effectively admitted the 51M campaign is dead and buried. With the earlier demise of AGAHST this leaves just StopHs2 and Hs2aa and neither of them are getting anywhere. One can only speculate how long their campaign can survive like this. The Bow Groups ‘fresh thinking’ is anything but. The Conservative Bow group are currently touting a ‘new’ report which claims we shouldn’t be building Hs2 but reopening old lines instead. The problem is, this report is neither new (it came out in August) or the ‘fresh thinking’ the group use as their slogan. The report seems to have only one function which is to say “anything but Hs2”. The reports main premise is that whilst the railways clearly need new capacity, this can be provided by reopening old railway lines. How? They never say. Instead, they quote a few examples of lines that have reopened (the Borders railway being one) or lines that they suggest could (BML2). What they fail to deal with is what happens to trains from these lines when they rejoin existing routes. For example. New platforms had to be provided at Edinburgh Waverley to allow the Borders railway to use the station. Edinburgh had old platforms to allow this to happen. Most stations don’t. So, what do you do then? The Bow group have no idea. The report also ignores the recent fall in performance & punctuality that has been linked to an increasingly crowded network. Put simply, the railways are that busy with extra trains there’s little room for the timetable to recover during times of disruption. The Bow groups ‘solution’ would be to make this worse. Here’s the group talking about the capacity question. So what’s their answer to this revelation? They don’t have one. That’s hardly surprising when you look at the references for this report. The group haven’t talked to anyone who understands how the railways work. Instead, they quote from the likes of the IEA and articles in the Daily Mail rather than Network Rail, timetable planners or signal engineers. Clearly, the only point to this report is to try & cast doubt on Hs2, not to seriously address the issues of capacity & congestion on the UK’s railways. If this muddy mélange of sources and assertions without answers is “fresh thinking” then we really are in trouble. My apologies for the lack of blogs recently. This has been due to a couple of factors. One was my hectic schedule at the excellent ACoRP awards last week & the volume of pictures it generated. The other was far less enjoyable: My laptop gave up the ghost. The poorly machine was on a service contract so it’s being looked after & refurbished by PCWorld. 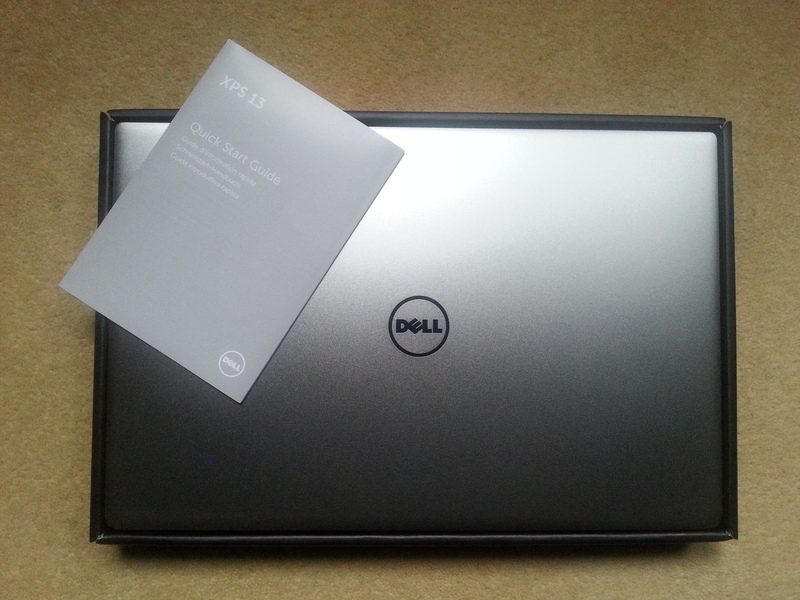 This left me with Plan B – an older Sony Vaio which has kept me going (ish) for the past week. Then, yesterday – this arrived. Now I’m almost there – so expect blogs to start appearing again.